This new bathtub transfer bench from Drive Medical features a sturdy A-frame construction with a collapsible back for easy storage, and its blow-molded plastic bench and backrest were designed for comfort and durability. This adjustable transfer bench features leg extensions that can accommodate any size of tub, and its design makes it reversible so you can fit it perfectly into any bathroom’s design. Safety and stability will never cross your mind with this bathroom transfer bench’s extra-large, locking suction cups that help keep the bench in place throughout use. Enjoy this Drive Medical transfer bench with tool-free assembly and free shipping! 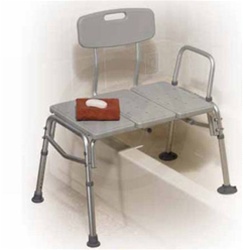 This chair is exactly as described - the legs adjust for inside and outside of the tub, and is very stable. I've had this bench for almost a year, and have been happy. I like that the legs can be adjusted, because the inside of my tub is slightly higher than the floor. I wouldn't want to sit it in for more than twenty minutes, the hard plastic can get a little uncomfortable. This chair is exactly what I was looking for. Sometimes when I buy things online, the product does not quite match the description. Not this time - the description of this transfer bench is very exact. The chair arrived just a couple days after I ordered it, and My Home For Life called to make sure I was happy with the purchase. I will come back to this site again! This chair is so well made and works very well. It is perfect for my needs.